WHAT was once a cane farm will soon become the site of Mackay's latest industrial estate. After sitting vacant for many years, civil works last week started at the former Erba cane farm on Production Drive. The 9.97ha site is being developed by Mackay businessmen and good mates Gary West, Peter Woolcock, Steve Amos and John Cooney, who purchased the land six years ago. 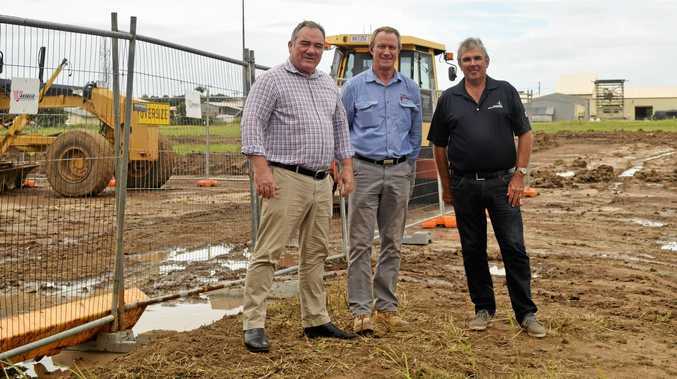 Mackay firm Vassallo Constructions was awarded the civil works tender for the project before Christmas and over the next 14 weeks project supervisor Mark Bowler and his team will transform the site into 'Production Park'. Aside from a few weather delays, Mr Bowler said the project was on track for handover in mid to late May. "We have eight to 12 people working out here and that will ramp up,” Mr Bowler said. Vassallo Constructions will also carry out the creation of the streets in the development, one of which will be named 'Erba Street' in a nod to the site's history. Investor and co-owner Peter Woolcock was on-site for the first day of earthworks and said it was exciting to see the project progressing. "It has been about six years that we have sitting on the land but now we think the time is right to develop,” Mr Woolcock said. Knight Frank marketing agent Mark Kelly said with a lack of quality buildings and land in Paget, interest in the project had been strong, particularly due to the attractive pricing set purposely below market value. "Production Park has had a lot of thought put into its initial design, with all levels of industry specifically catered for,” he said. "The land areas range from 2829sq m to 9711sq m and all are accessed via a wide, well constructed road being the continuation of Production Drive. "B-double truck provision forms part of the design and the estate's ideal central position proves highly beneficial with all service industry wishing to base themselves here. "We have had a bit of interest from local builders that are keen on getting a design and construct going, which means the tenant pre-commits to the building. ”We expect a couple of buildings to be commenced in the next four to six months,” he said.